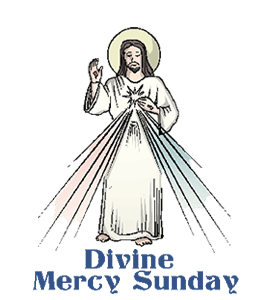 ﻿Divine Mercy Sunday: Calendar, History, Tweets, Facts, Quotes & Activities. Divine Mercy Sunday is an Observance in the Roman Catholic Church in which followers are encouraged to offer forgiveness and reconciliation to all. It is based on visions recorded from St. Faustian Kowalski. In 2000, it was decreed a solemnity, a high feast day, by Pope John Paul II. Roman Catholics are required to attend worship, go to confession, and take Holy Communion. Divine Mercy Sunday occurs the Sunday after Easter. St. Faustian was a Polish nun who lived in the early 20th century. She devoted her life to spreading the word about God's forgiveness, or divine mercy, for anyone who asks for forgiveness. Although she was a mystic, she also cooked and gardened as part of her convent life. St. Faustian had visions much of her life. One that was the most profound was of Jesus, with one hand raised in blessing and with two fingers of his other hand resting on his heart. She said that Jesus asked her to have the image painted, and to include a prayer that said, "Jesus, I trust in you." This is the prayer that Catholics recite on Divine Mercy Sunday. Most priests preach on the story of Doubting Thomas on Divine Mercy Sunday (John 20:19-31). Thomas, also a saint in the Roman Catholic Church, was one of the Jesus' apostles. When Jesus arose from the dead, he didn't believe it. Jesus directed him to touch his crucifixion wounds to help him believe. Jesus doesn't chastise Thomas for his disbelief, which is considered an act of mercy. If you are Roman Catholic, left the church, and want to come back, ask a priest to give you the Sacrament of Reconciliation. It is offered in churches throughout the year, but is particularly appropriate on Divine Mercy Sunday. Take Holy Communion. This sacrament in any Christian church represents unity with everyone who believes in Jesus Christ. Go to confession. Understanding that every person falls short is an important part of Christianity. In the Catholic Church, priests give acts of penitence after confession, which often involves prayer. They also offer forgiveness. Watch a movie about forgiveness. Some excellent films include "The Color Purple" (1985), "The Green Mile" (1999), and "Pay It Forward" (2000).